To anyone experienced with live music, the Marshall amplifier is one of the most iconic pieces of audio gear in existence. 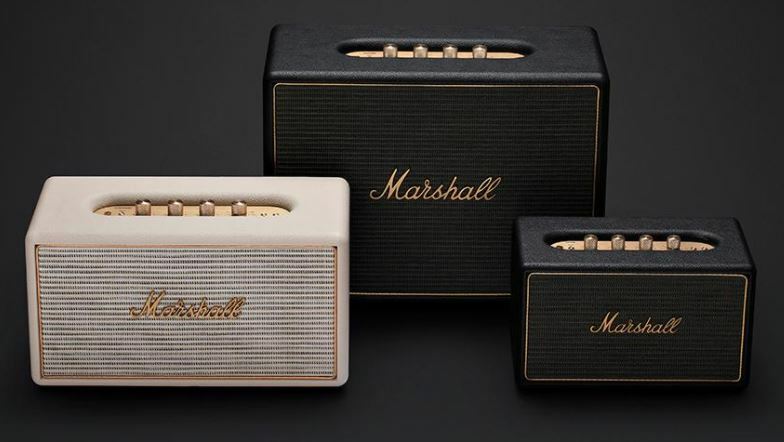 Founded in London, England in 1962, Marshall amps were soon adopted by musician such as Pete Townshend, Jimi Hendrix, Eric Clapton, and countless other blues and rock bands. With over 50 years in the music industry, Marshall has clearly withstood the test of time and seen a lot of changes along the way. Recently, Marshall has shown they can continue to adapt to the times by releasing a line of smart speakers fusing the latest technology with their decades of quality audio engineering. Styled to match their most iconic gear from the past, the result is a fantastic combination of cutting-edge features and instant nostalgia sure to attract attention from any musician or fan. With a complete line of Bluetooth or WiFi speakers ranging from handheld portables to larger in-room units, Marshall has you covered with classic styling and premium quality at home or on the go. Today we’re taking a look at the three in-home, multi-room Wi-Fi models, the Acton, the Stanmore, and the Woburn. 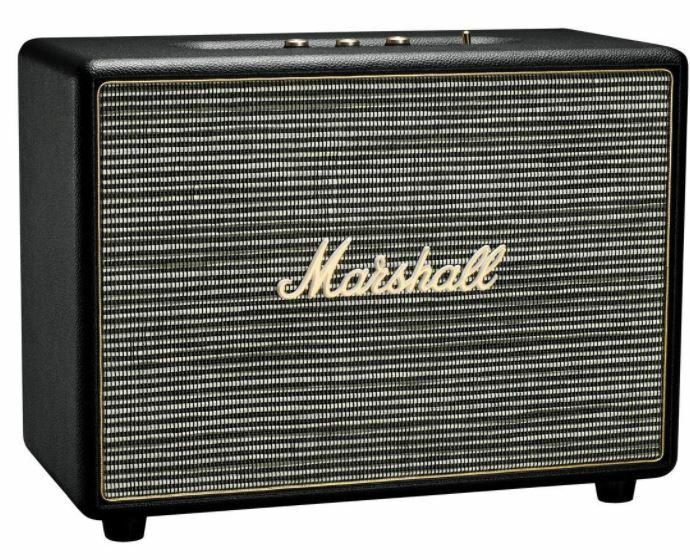 Far from a simple attempt to cash in on the nostalgia factor, these surprisingly versatile and well-thought speakers show that Marshall still cares about what matters – the music. Each speaker, the smaller Acton, medium-sized Stanmore, and larger Woburn, feature the same design scheme. Available in Black or Cream, the classic boxes have a premium-quality textured finish, brass accents, and a brushed brass control panel on top with actual analog knobs and buttons. 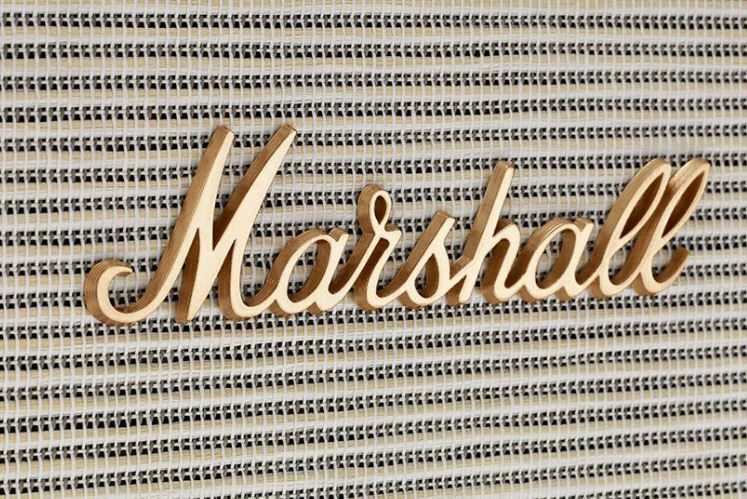 Of course, the front speaker grille wouldn’t be complete without the iconic script “Marshall” name front and center. While most modern Bluetooth speakers have simple clickable buttons and cheaper plastic materials, we absolutely love the quality and attention to detail from Marshall. Before you even turn them on, it’s readily apparent how much the company loves their products and music in general by the obvious care they took in designing every detail of these speakers. To any musician or audio enthusiast, the visceral experience of the weighted brass knobs, satisfying click of the buttons, and quality of every material will surely evoke a feeling of more “real” audio. In a time where nearly the entirety of music ever made has been digitized, downloaded, or streamed, these speakers remind us of when every album was a valued possession to be experienced and appreciated. 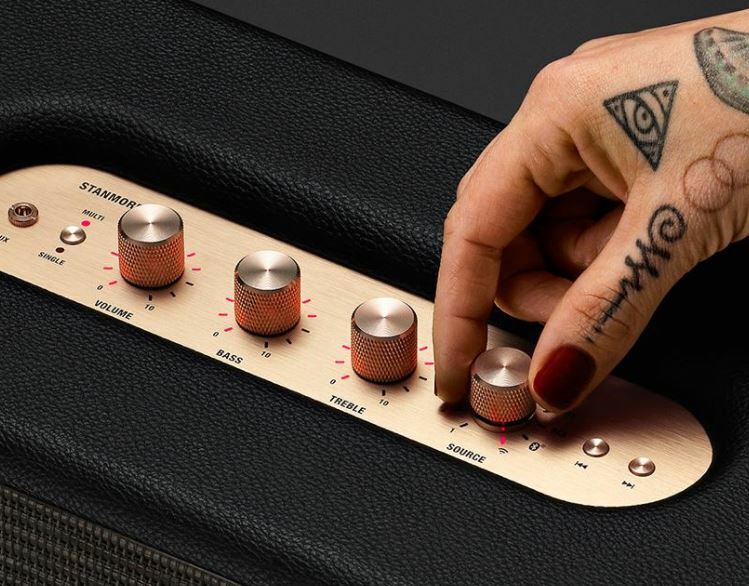 While we’ll cover connectivity in more detail, the decision to include an analog 3.5-millimeter input jack shows Marshall’s commitment to the music. If you decide to pause the streaming music, you can plug in a turntable or an instrument of your own. Despite being loaded with technology, this means that these speakers don’t just look like real gear, they are real gear. Starting from the smallest, the Acton measures 10.5 x 6.3 x 5.9 inches and weighs 6.2 pounds. It’s perfect for smaller rooms and can fit easily even on a tiny shelf. It has a 30-watt amplifier for the woofer and two 10-watt amplifiers for the tweeters together capable of producing a maximum 103 decibels at 1 meter. Stanmore is the “Goldilocks” of the group, striking a balance between size and volume. Stanmore measures 13.8 x 7.3 x 7.3 inches and weighs 10.4 pounds. A 50-watt amp drives the woofer and two 15-watt amps drives the tweeters. Pumping out 108 decibels at 1 meter, the Stanmore can fill larger rooms with clean, rich sound. Lastly, Woburn is the biggest of the bunch and can handle huge spaces or noisy crowds. At 16.8 x 11.4 x 7.9 inches and 17.4 pounds, Woburn won’t get tucked away on a bookshelf. With two 40-watt amps driving two woofers plus two 15-watt tweeter amps, Woburn can produce up to 112 decibels, approaching the volume you’d hear at a live show. Though the speakers do support Bluetooth, don’t mistake them for little battery-powered portables. This kind of performance requires a powered connection, and while small enough to move if necessary, these are intended to provide premium audio in your home. While all three models have less expensive Bluetooth-only variants, today we’re looking at the Wi-Fi versions. The addition of Wi-Fi capability greatly expands the features, options, and convenience of these three speakers. While Bluetooth remains a tremendously popular connection options due to its universal adoption, it has a number of limitations. Bluetooth requires your smartphone or other device to form an individual connection with one speaker. Transmission range is limited to about 30 feet and can drain a fairly high amount of phone battery. Though you may not notice it if you mainly play MP3s or streaming music, Bluetooth has to reduce the quality of high end audio due to smaller data transfer rates. Also, if you’ve ever streamed music at a party, you probably know that receiving a call will interrupt your music and can bring the vibes to a halt. While Bluetooth connection is still an option, the Wi-Fi versions also support Apple AirPlay, Spotify Connect, and Chromecast Built-In. By utilizing your home’s wireless network, these connection options allow you to control your music and stream from anywhere you have a Wi-Fi signal. It also permits higher sound quality while minimizing battery drain on your device. Phone calls and texts won’t stop the music and you can connect and share music from multiple devices. Undoubtedly, multi-room audio represents the biggest game-changing feature enabled via WiFi. You can start with a single speaker and expand your system over time to include up to five Marshall speakers in any room of your home. That way you can privately listen to audiobook in your office, or thump music through your whole house for a party. 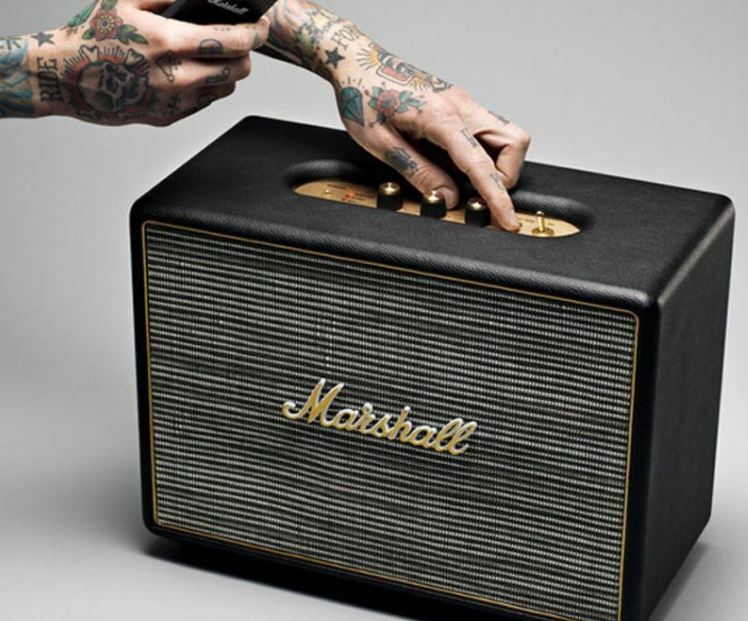 Marshall gives you far more control over your sound than a standard wireless speaker. 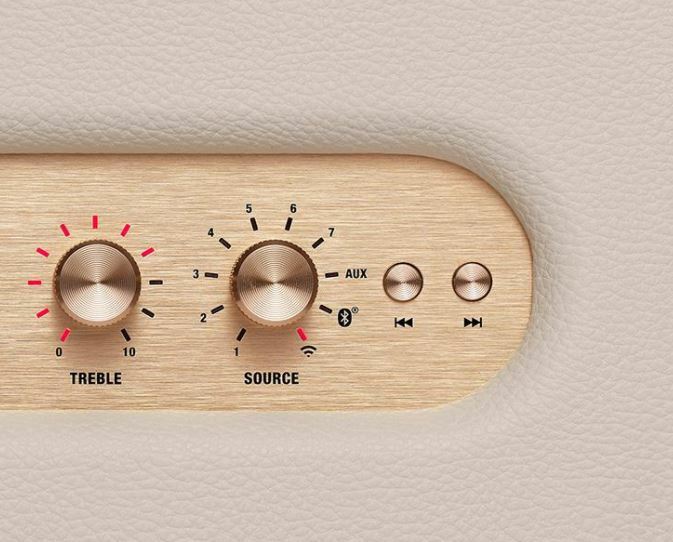 The control panel on each model includes brass knobs for Volume, Bass, Treble, and a source selection with customizable presets. Additionally, buttons let you toggle single versus multi speaker mode and skip tracks forward or backward. Aside from the on-speaker controls, the Marshall Multi-Room app, available for download on Android and iOS devices, unlocks the full potential of your speakers. Using the app, you can configure single or multi-room wireless systems. This allows you to name speakers for identification and dynamically assign individual speakers to single or multi-room mode. Also, you can configure the one-touch presets, adjust equalizer settings, and even alter the intensity of the LED lights. With the persistent Wi-Fi connection, Marshall will automatically update your speakers when new features or compatible music services become available, so you’ll never be out of date. We found the multi-room setup and app management to be a breeze. We placed differently sized speakers in different rooms, and in “Single” mode, we were able to switch between speakers in mere seconds. Switching to multi-room instantly filled our whole home with sound. Controls were intuitive and functioned exactly as we expected them to function. Even when using the auxiliary input or direct Bluetooth connection, one speaker can act as the master and distribute audio to the rest of the house. Though you may need to purchase an adapter of some kind, this is a great way to get audio from your home theater system to the whole house. Now, none of the features and looks would matter if the Acton, Stanmore, and Woburn didn’t sound good. Marshall could have easily slapped their logo on a cheap lookalike and assumed some people would buy just for the nostalgia and name recognition. Fortunately, that isn’t the case. Though each has different sizes and capabilities, every one of these speakers sounds amazing for its size. With decades of speaker experience, Marshall packs quality components inside for a clear, rich, lifelike sound. We may not go so far as to say they’re the best wireless speakers we’ve ever heard, but they’re certainly high quality. Often on cheaper speakers, it’s hard to discern subtle nuances of the original audio. Many people don’t even notice the lack of quality due to digital compression from MP3s or streaming sites, and with low quality speakers or headphones in may not even be apparent. Using the same test tracks, we switched between full-quality, lossless local files and heavily compressed content streaming over Bluetooth. Each speaker alone sounds clear and loud enough for an appropriately sized room, but added benefit of multi-speaker mode means you can expand to handle even very large and loud gatherings. While the larger Woburn handles bass adequately, if we had a suggestion to improve the sound, it would be the ability to connect a dedicated sub-woofer. The two 5.25 inch woofers deliver a rich, balanced range, but there’s certainly something lacking on the low end when it comes to bass-heavy songs or low frequencies in a movie. Obviously, these aren’t designed to function as part of a multi-channel home theater system, but they do bring great sound to match a great look. Marshall’s Acton, Stanmore, and Woburn Wireless Multi-Room speakers deliver premium sound, iconic style, and modern technology. Now, if you’re a true audiophile, or you have the resources to install real multi-room home audio, these speakers may not sit at the top of your list. That certainly doesn’t mean they aren’t of exceptional quality for their intended purpose. Marshall knows that the design and appearance of the speakers sit on display as much if not more than the sound they produce. These speakers exude quality and style and are sure to grab the attention of any musician or fan who sees them. Far more than just an invisible speaker in the background, the premium materials and analog controls demand to be noticed and touched. While the original Bluetooth-only models were popular in their own right, Marshall proves their dedication to their products and music with the upgrade to WiFi support. The improved sound quality, expanded connection options, and simple multi-room controls make this speaker system flexible and powerful. Marshall’s Acton, Stanmore, and Woburn speakers are incredibly well designed both inside and out. The fact that they sound fantastic makes them a must-have for any musician or fan. Can I use my Windows 10 Laptop to connect to them via Bluetooth? I was always using AUX cables but I might switch to wireless if it’s worth it. And by the way, when did Marshall decided to create speakers? A guitar amplifier and a speaker for music do differ more than you might think. I’ve been researching similar topics myself and I think the answer is YES. However, Marshall’s same lines have one version back that is aux and Bluetooth – but not wifi and not called ‘multiroom.’ I found the bluetooth Acton on UO (and some other places) at an amazing price, and am fine with using the aux cables which I have to do with record player anyway. So I suggest you check out the non-multiroom older version to save some money if you don’t care about the wifi! Now my main question was- if later down the line I want to create the multiroom experience will I be able to sync the older bluetooth model with a new multiroom wifi/bluetooth model? And I’m pretty sure my question gets a YES also. So I’m going for the deal bc it’s too good to pass up plus it’s the only one in my budget now, and in a few years when I’m swimming in money saved up from years of my high paying teacher’s salary, I may be able to then expand my home audio system.